The Hidenka River is the border of the Hidenka Pack's territory. The easiness of crossing depends on which path taken. The currents go faster the downstream where the water flow past the large rocks and falls down the waterfall. 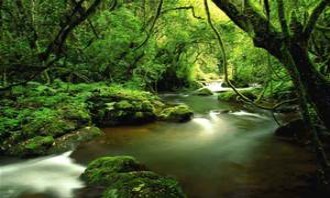 The river provides good water to drink and water animals to eat. Herbivores often come here to drink. She let her paws guide her over the earth as she looked around in sunlight. She had been wandering ever since her crush, Abel from another pack lashed out at her. Sighing tiredly she listened to a river and then went towards it. Her life had turned upside down once again. Making it to the water she quickly took in the coldness of the water. It was refreshing. It soothed her body although it was cold. Catching the sound of movement she lifted her head quickly looking around again and took in the scents. She didn't smell anything out of the ordinary besides the pack that resided on the other side of the river. Ginger was tempted to cross over but the scent of a cougar hit her nose. She turned away and started back in the brush but froze when she heard a low rumble. Pricking her ears she turned her body back around then heard a loud yowl and felt hard weight land on her back. With a surprised yelp she threw herself forward into the river. She splashed around in the river then felt somebody grab onto her and pull her to shore. She coughed laying on the ground and then sat up seeing the male that saved her. "T...thanks" she stood up and moved a bit away from him before shaking out her fur. Ginger then let her amber eyes fall back on the male. He smelled like a pack wolf. "Sorry...I didn't mean to come close to your territory. I've just been wanderin for so long..." she said sitting back down looking at the ground avoiding his gaze. She waited for the male to speak and then lifted her head saying "My name is Ginger. Ah...are you the alpha of this pack?" She was hoping he'd say yes. Ginger was tired of walking. Tired of running. Tired of being alone. She wanted to belong somewhere and actually have a purpose to her life.